Well, better late than never. 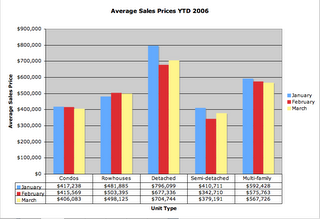 I've put DC's August 2006 sales data into my model to see how the market is faring compared to August 2005. 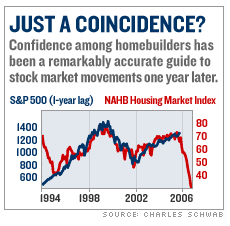 As I'm sure you're aware from recent news reports about the national housing market, it isn't good. And it isn't good in DC, either. Essentially, transaction volume has collapsed, down 41.62% YoY. Every type of housing showed less demand. 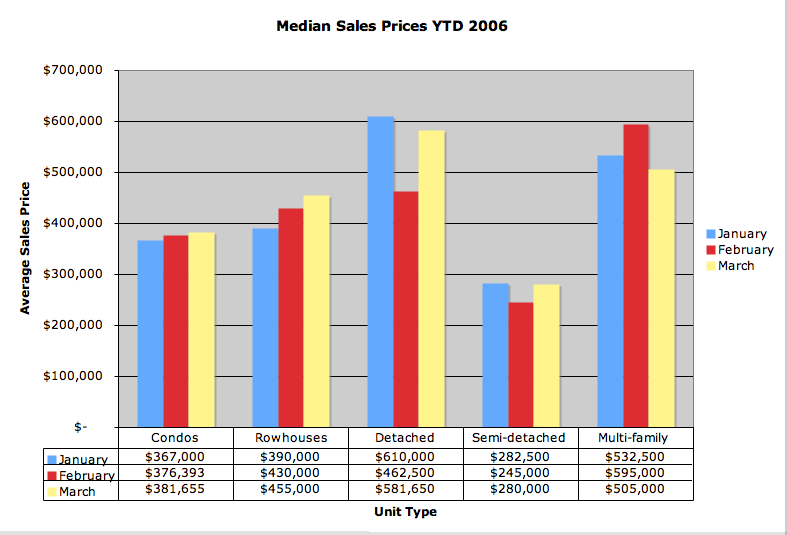 For the first time in 2006, average and median prices for condos were both lower YoY and sales volume was down 53.39% YoY. 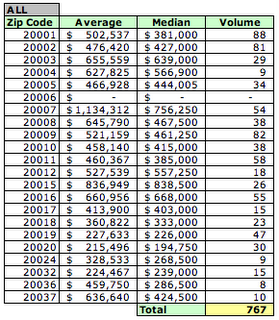 More importantly, the median price for all housing in DC was down 1.23% while average prices inched up almost 2%. 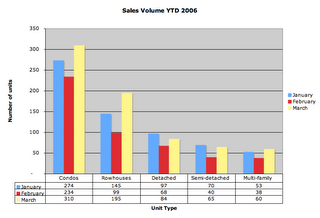 Even after excluding those new units from the August 2005 data, YoY condo sales volume was down 28.9%. I've just uploaded DC sales data for August to DCHomePrices.com. 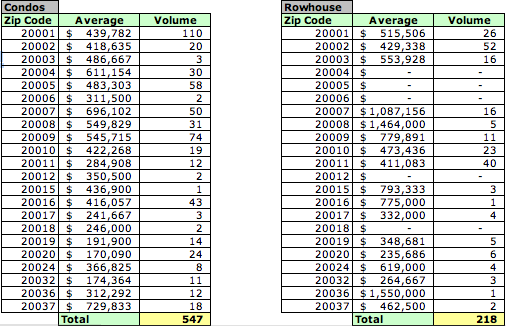 Of the 800 sales records I processed, 363 are condos (average sales price: $401,852), the remaining 437 are single family or multi-family homes. Generally, condos represent about 50% of all units sold in DC each month. However, condos aren't displayed when you visit DCHomePrices.com ; the site provides information only on sales of single/multi-family homes. Visits to this blog confirm the level of interest in condos in the DC market. 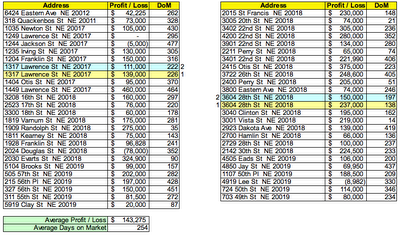 To address that, I'm launching a new site in the near future focused on DC condo sales. It's intended to provide sales data for condos sold in DC. I'll post an update once the site has launched. Email me if you want more information about the site. MRIS has just released sales data for sales of existing homes in September 2006 (see below). The trend I mentioned a month ago continues: the number of units sold continues to decline. What's especially remarkable is that September marks the end of the summer sales season, when housing sales should be at their peak. If condos are excluded, the total dollar volume actually declined 9.54%; condos represented approximately 38.47% of the dollar volume. All housing categories in the report save one showed YoY declines in sales volume despite higher average sales prices. A constant refrain I hear is that while the DC condo market is tanking, the market for single family homes (SFH) is doing well. Is that true? 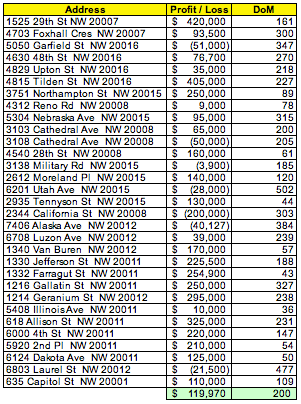 At first blush, MRIS's data for August SFH home sales in DC doesn't look too bad once condos are excluded. Except for two categories that experienced small drops - attached homes with 2 or less bedrooms and detached houses with 3 bedrooms - all housing categories experienced price increases in August YoY (see below). The average price for detached homes with 4 or more bedrooms went up 16.5% YoY! MRIS's summary data doesn't look too good, but one assumes that's because it includes condos. However, further analysis shows that SFH homes are in trouble, too. When all housing categories (again, condos excluded) are pooled together to gauge the overall market's pricing trend, it turns out that the weighted average price for SFH housing in DC went up only 0.75% YoY in August. And, comparing YoY sales volume, one finds that sales for detached homes were down 48.8% and that of attached homes was down 29.3%. So the data really shows that for SFH homes, too, pricing momentum has stalled and demand has fallen off the cliff. It'll be interesting to see what September's data shows when it's released by MRIS within the next two weeks. I'm aware that most of my posts have focused on the condo market, which can be explained by the fact that condos constitute about 50% of all housing sales in DC. However, to maintain a "fair and balanced" approach, I've begun researching flips involving single family homes (SFH). 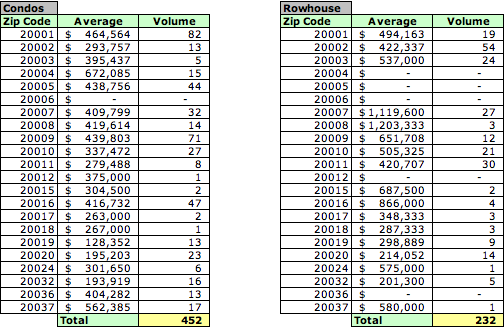 DC groups SFH into three categories: rowhouses, detached houses, and semi-detached houses. 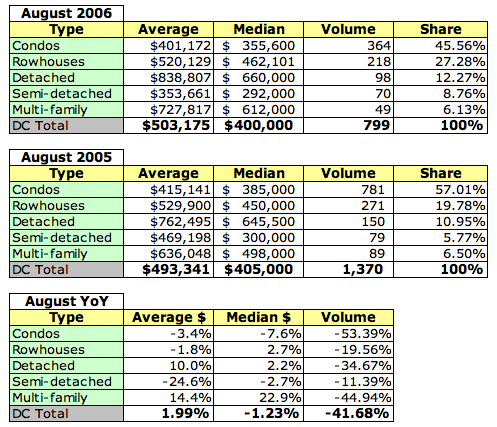 My first analysis is of detached houses flipped between January 1, 2005 and July 31, 2006. 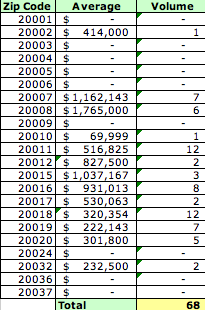 To be included in the analysis, the home had to have been purchased and then resold during that period; initial purchases pre-dating January 2005 are not included. 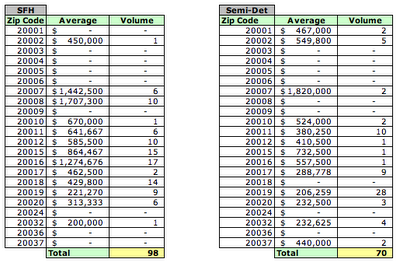 During the analysis period, 96 detached homes were flipped in DC. Of that number, 31 were sold in NW, 51 in NE, and 14 in SE. 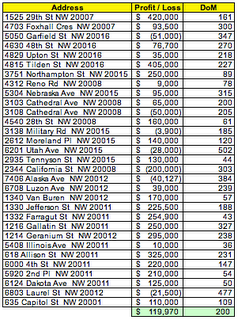 I'll first post information about detached homes sold in NW DC. 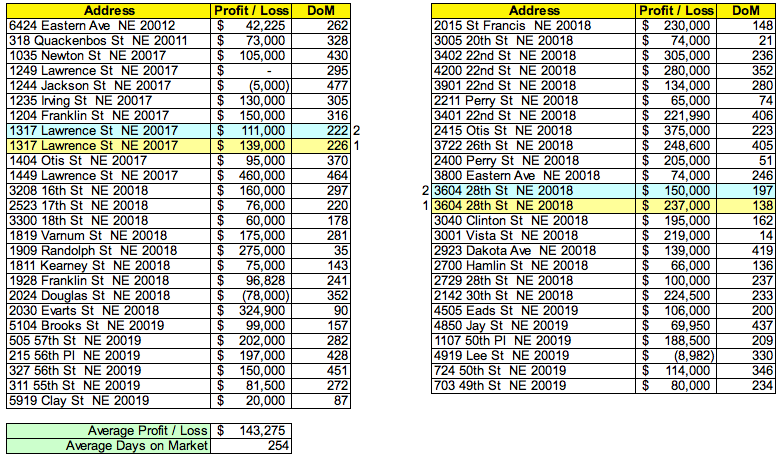 The table below shows those homes that were flipped in the analysis period, with each sale's profit/loss and days on market (DOM) shown. 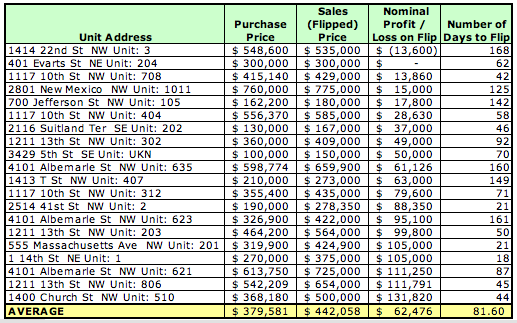 In the aggregate, the flip of a detached home in NW DC yielded a $119,970 nominal profit after an average 200 DOM. 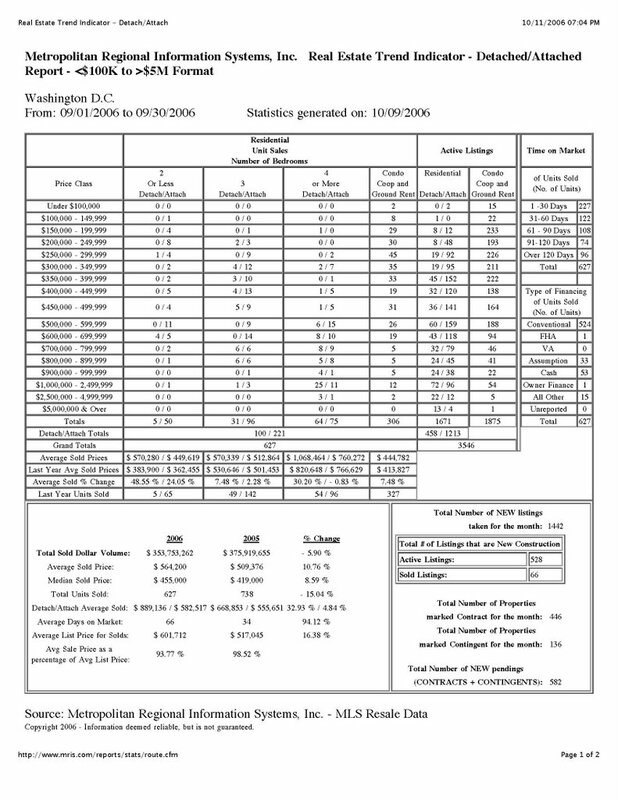 My analysis depended upon real property sales data available from DC; it's quite possible there are errors in their data (believe me, it happens quite frequently), but I've done my best to either correct the data or delete records with egregious errors that I cannot correct. 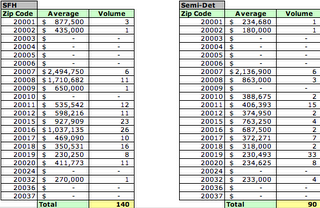 Two flips in NW DC were excluded from this analysis because I had doubts about the data. The Quincy Court Condos (1117 10th Street NW) closed in late Spring 2006. Through July, five units have been flipped, most recently units 304 ($67,000 nominal profit within 75 days) and 310 ($64,000 nominal profit within 74 days). Unit 1004, purchased for $629,050 in May, is being advertised on craigslist for $724,990. The building was reported to have 146 units, but DC sales records show that only 119 units have closed through July. The block this condominium is on has the distinction of having the most housing units sold in DC in 2006 (to date). 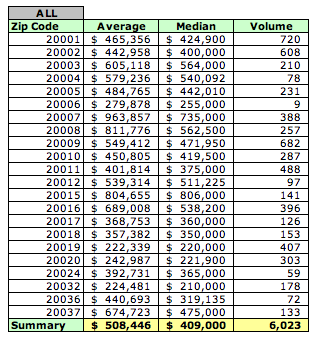 Having determined that the July 2006 citywide average and median sales prices were $536,685 and $421,000, respectively, I wondered how each zip code's average and median prices compared to that of the city. 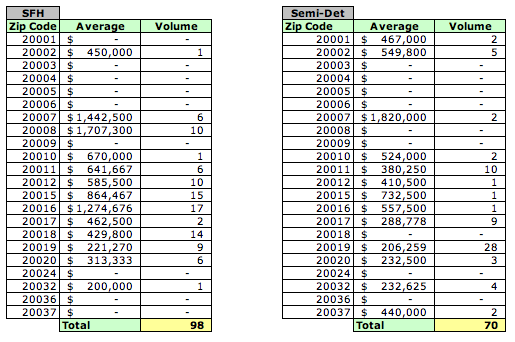 Interestingly, more than half of the zip codes (14) had lower average sales prices while ten had lower median prices. 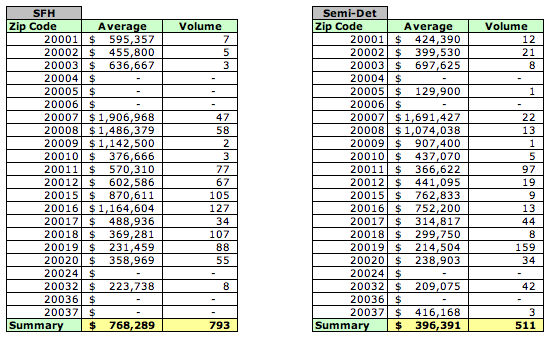 The three zip codes with the highest average prices were 20007, 20015, and 20016. I just ran an MRIS report for August housing sales in DC; it shows that YoY transaction volumes and prices for condos sold in DC have fallen. 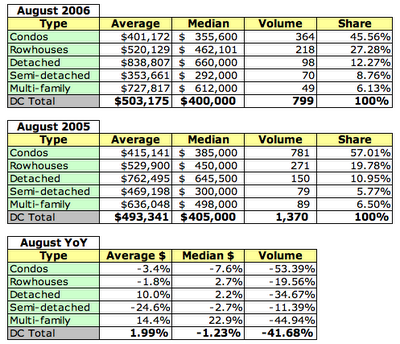 The August transaction volume is in line with what my analysis of DC data for July showed. Since MRIS reported a 6.5% decline in average price for July's sales, the fact that the decline accelerated - almost doubled - in August must be worrying to sellers. MRIS doesn't break out median prices by type of housing unit, but "eyeballing" the report shows that the median August sales price for condos was approximately $350K. 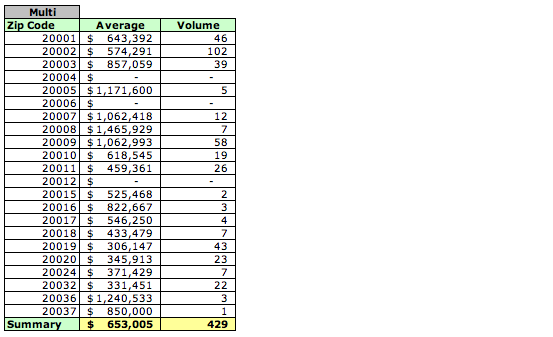 The report also shows that the aggregrate transaction volume (all types of housing units) declined 34.4%. Note: MRIS reports only sales of existing units. 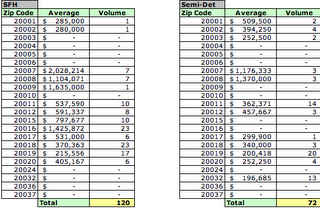 It'll be interesting to see what the data show once DC posts all August sales records next month. I suspect that, as in the past, including the sale of new units will improve the aggregate average price, if not the median. After posting DC July sales data to DCHomePrices.com last Friday evening, I had a chance Saturday to begin my analysis of the data. At a glance, the data do appear to indicate that the DC real estate market is slowing down, at least in terms of transaction volume if not in terms of prices. 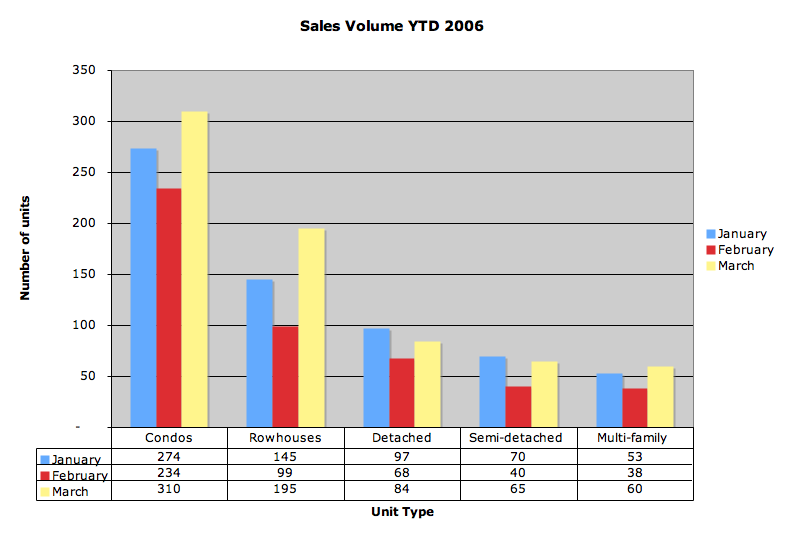 This is the first time in 2006 that monthly data show YoY declines in sales of all types of housing units. In the aggregate, YoY transaction volume is down almost 35% although average and median prices have gone up. For the first time since at least January 2005, condos constitute less than 45% of all units sold. 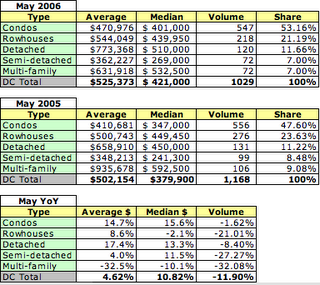 Across the board, YoY transaction volume is down for all types of housing units. 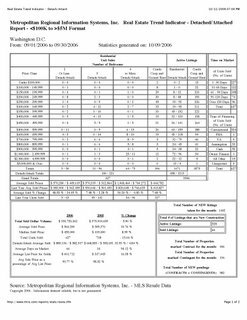 Please understand that my data includes new and existing homes so there may be some discrepancy between my data and that from other sources, such as MRIS, which only report sales of existing units. As I may have mentioned in previous posts, condos typically constitute approximately 50% of housing units sold in DC and given the number of new units closing each month, that may skew my data vice MRIS. 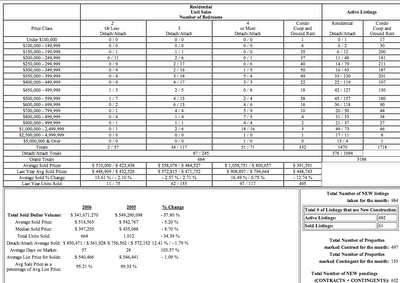 However, I get my data from the DC government so I am collecting actual sales data. MRIS showed that average prices for condos in DC declined 6.5% in July, but since my data include new and existing units, I have to assume sales of new units provided enough price support to show an aggregate 8% gain. 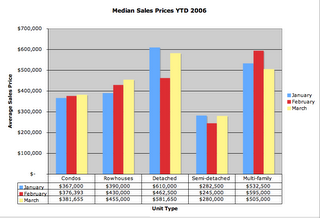 However, the median price for condos did fall 1.9%. I found a link to an interesting economic analysis of the housing market on craigslist last night. It provides an interesting explanation of the drivers of the booming housing market in the first part of the decade and describes a scary prognosis for the country's economic future as the housing boom unwinds. 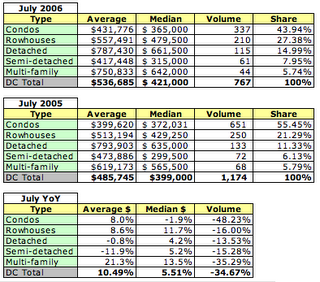 One highlight: for condos, this is the lowest share of monthly sales for the year, if not since January 2005. I'll post more information (and maybe corrections) once I'have a chance to analyze the data. 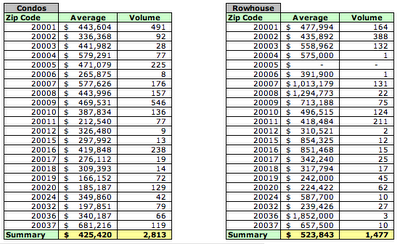 Here's sales data for condos flipped in 2005 at the Cityline at Tenleytown and Residences at Gallery Place. Five were flipped at Cityline and 10 at Residences. 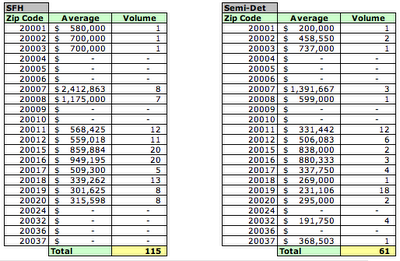 More may have been flipped through contract assignment prior to closing, but this is based on available public data. 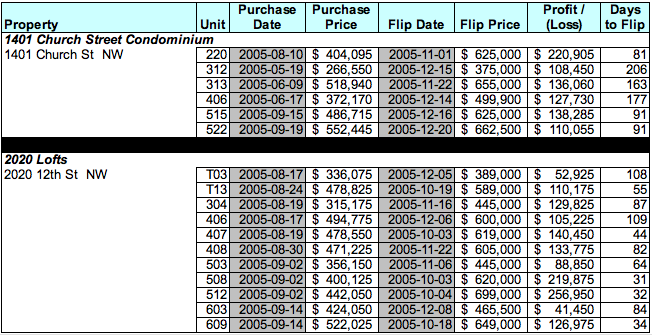 The nominal profits were good except for the seller of Cityline #421, who flipped at a loss of $900; I have to imagine the net loss was much worse for that flipper once almost six months of carrying costs and the unit's closing costs are factored in. The average nominal profit at Cityline was $89,106; for Residences, it was $119,724. Average time to flip: 83 days for the former, 171 days for the latter. Cityline #535 wins the prize, flipping within 23 days for a profit of $124,543. And the nominal profits were good. 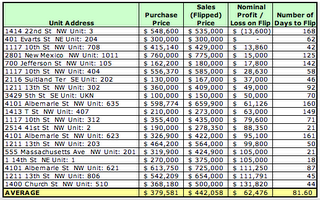 The average nominal profit at 1401 Church St NW was $140,248; at 2020 12th Street NW, it was $127,861. Average time to flip: 135 days for the former, 66 days for the latter. See below. I analyzed DC sales data for 2005 to see how many condos were flipped and what profit was achieved. I'm still analyzing the data, but the initial results are below. 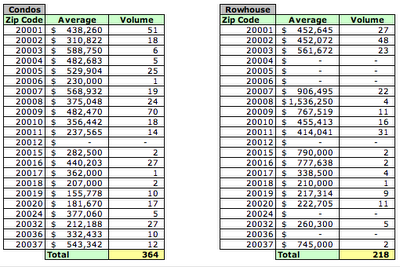 Of more than 5900 condo sales in DC in 2005, 85 were of condos being flipped. The data below, which does not include those condos purchased in 2005 and sold in 2006, shows the average and median purchase and flip prices, profit, and days on market (DOM). When discussing the condo market in DC, a key assumption is that much of the market's zeal has been driven by buyers who flipped their condos soon after - if not before - the closing date. 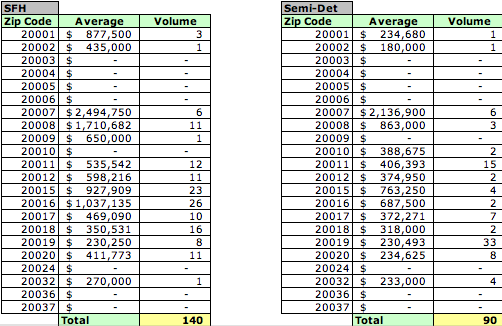 However, my analysis of DC 2006 sales data (January - June) could find only 20 instances - out of 2032 condo sales in 2006 - where a condo was resold, or flipped, soon after it had been purchased. 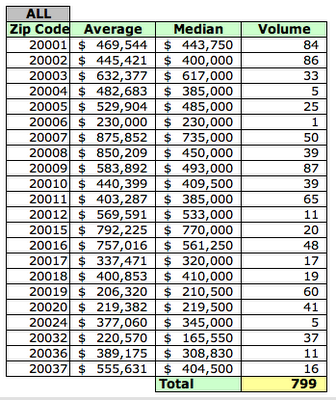 In these 20 instances, flippers paid an average price of $379,581 for a condo and flipped it in 81.6 days for $442,058, netting an average nominal profit of $62,476. The analysis was restricted to those units that had first closed in 2006 and had then been resold; units that had closed in 2005 and resold in 2006 were not included in this analysis, that will be the next step in the process. While all but two owners made a nominal profit, it's hard to determine anyone achieved a real profit once carrying costs, transaction fees, and the time value of money are taken into account. 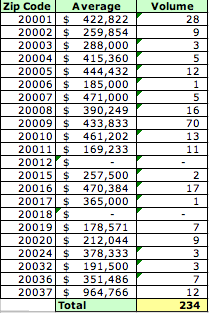 For example, the owner of 4101 Albemarle St NW Unit: 635 made a nominal profit of $61,126, but the resale closed 160 days after the original purchase. A 6% real estate agent commission on the flip would cost $39,594, leaving approximately $21,500 to recover five months of carrying costs and, hopefully, with some remaining for a real profit. In June 2006, 972 properties were sold in the District (see DCHomePrices.com). 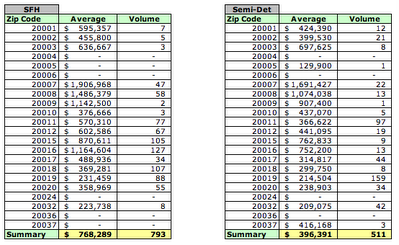 Compared to June 2005, average and median prices increased 7.22% and 6.02% respectively. 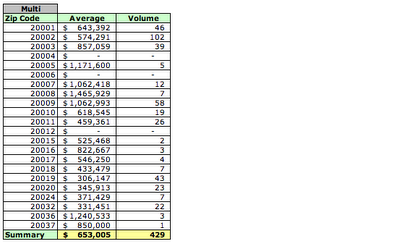 As in the past, condos constituted the largest share of the reported transactions, 452 units (46.5%) of 972. 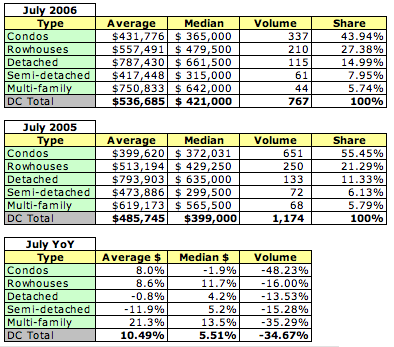 However, total units sold decreased 17% YoY, with the number of condos sold dropping 23.9%. I guess the real estate market is going to the apes! Average sales prices for condos declined (-2.67% January to March) while the median sales price increased (up 3.99% January to March). Average and median sales prices for detached single family homes declined (-11.48% January to March and -4.65 January to March, respectively). However, three months data is insufficient to determine a long-term trend. 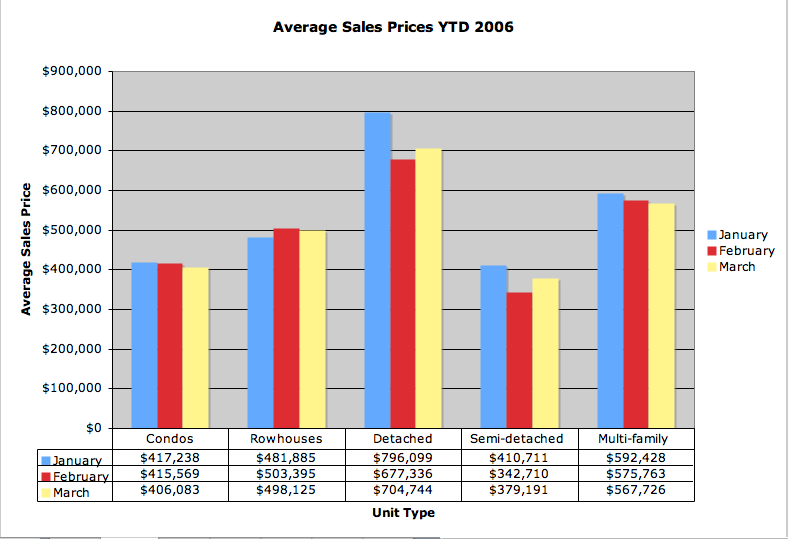 Sales data for March 2006 has been uploaded to DCHomePrices.com. 714 residential sales were recorded in March. Average and median prices and volume by unit type are depicted below. Sales prices in February 2006 for DC single family homes are listed below. I've added February 2006 DC home sales data to DCHomePrices.com, which can be searched and have the results displayed on a map of DC. Now I've begun analyzing the data. 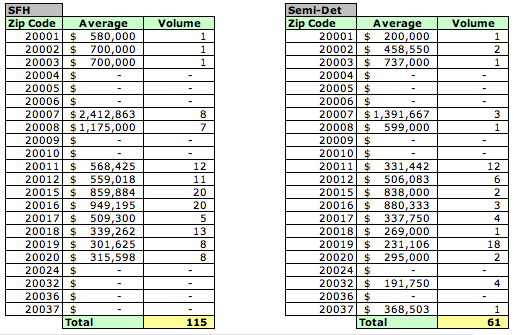 Below is sales data for condos organized by zip code. Rowhouses, single-family homes, and semi-detached homes will follow. I've excluded multi-family from this analysis.